A quick 200km sandy track enters into the north plateau of Congo. Some bridges, some fords and many muddy puddles force us to slow down drastically. When it is not raining, it is very hot and the sun beats down relentlessly. The Chinese are working, laying asphalt. If they manage to finish, within a year, no one will be able to enjoy this road in the heart of Africa as we just have. Everything goes well but one of them has had a little too much palm wine and keeps pestering us, asking if we have a bottle of whisky. Luckily, he is not the boss. Everything goes smoothly but we remain in the hut for about 45 minutes because Antoine, who is a passionate catholic, knows all the stories of all the saints… life and death. Moreover, he wants to tell us about all of them. He thinks that, since we are Italians, we are experts on this subject. He asks us how many times we have seen the Pope. He gives us a gift... a mature mango. We give him a map of Nonantola with the abbey. However, it was nice meeting him. Under the flag under the direct sun, we are officially welcomed. A few minutes later and we are off. Everything goes smoothly here as well. No requests. Along the road, some children are selling guava. 100km from the frontier, we encounter our first village. The chief of the local police wants to see our documents. Outside the office, there is the bloody head of an elephant. It has no skin or flesh. A skull full of flies. The size of the tusks, I guess to be about 40cm. He tells me that poachers killed it. I tell him that I have not bought ivory for over 20 years and that I do not support the hunting of elephants. A trap or just business? Heading south, we stop in Oyo. 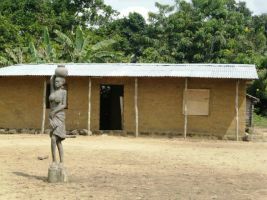 A few years ago, just a few kilometres to the north, a crowd killed a missionary from Milan with a machete. He had accidentally run over a little girl. She was still alive and he had got out of the car to take her to the hospital. In Africa, just as in Asia, if you have an accident, especially if there is a casualty, the best thing to do is run to the nearest police station. Those that have read Shantaram will remember an interesting article where Gregory David Roberts recounts a similar situation in Bombay. One should always keep this in mind when driving a vehicle on the roads of Africa. We stop inside a Polish mission. 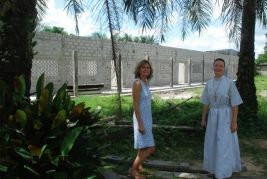 We also meet the local missionaries that tell us about the school. We assign them an ELFO token (details in solidarity). One of the few parks in Congo. 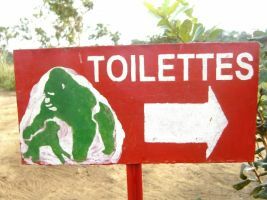 One of the few parks where you can see gorillas up close. The entry fee is 15euro (£12) and to see them 80euro (£64) each. But it is worth it. They have been taken from captivity and given a life of freedom in the forest. 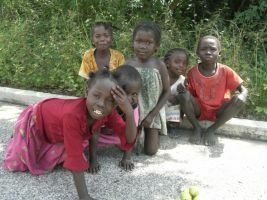 A local organization looks after them from their headquarters in Brazzaville. In the photo is an 18-year-old called Titi. There are two entrances to the park. 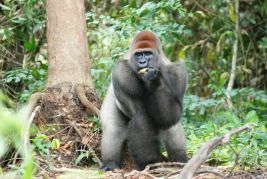 One to the North called “Abio” where you can see the adult gorillas. And one to the South called “Mont Blanc” where you can find access to the Lac Bleu and the area where the baby gorillas are looked after. In this photo is 19 year-old Rupert. These three are all dominant males. 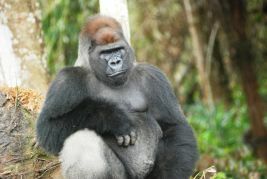 They are “silverbacks” so named for their distinctive patch of silver hair on their back that is typical of the males. They live together peacefully because there are no females amongst them. In this photo is 21 year-old Sid. 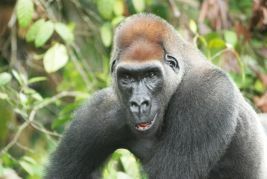 The gorillas are on a small island in the Luna River, which we reach by pirogue. The whole excursion lasts about an hour. There are also crocodiles and hippos in the river, but we see them rarely. We can have the permits issued in Brazzaville or here in the park at one of the two entrances. 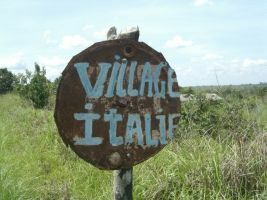 The capital city of Congo carries the name of an Italian explorer. He was the one who founded and discovered it. 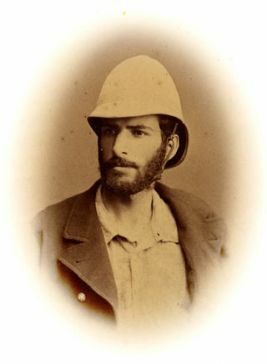 Very few Italians know him because of his French naturalization, but he was one of the most important African explorers of the late 19th century, up there with Livingstone and Stanley. In the city, there is an enormous and stupendous mausoleum under which he is buried. 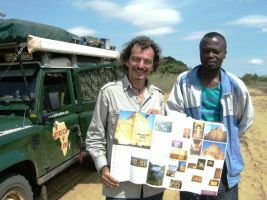 There is an interesting website that talks about his history and the history of African exploring. …after the wedding, Pietro and Thérèse, of Brazzà, leave for Italy. In October, we find them in Paris where Brazzà is coming to grips with a recent invention, the bicycle. “Everybody moves around the road on bicycles. Initially, it seemed just peculiar to me. But then I reflected upon it and I said to myself, I need to try it out, what the hell! And so I did”. 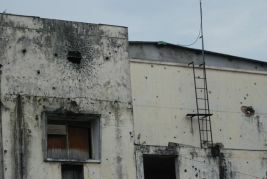 The city is calm, regardless of the scared walls left by the grenades and bullets during the recent civil war. Getting the Democratic Congo Republic visas here was a good move. Only two photos and a photocopy of the passport. A waste of time. We cannot even enter the visa office. The people responsible are always out, or in a meeting. After two days, we give up. We will try again at Kinshasa. He has practically travelled around the world on his own, on a bicycle and all within two years. 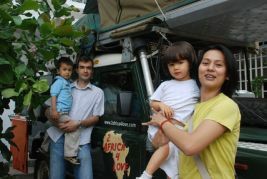 He now lives in Brazzaville, together with his charming wife and his two children. They run a restaurant: The Hippocampe. They welcome and pamper us like old friends would. We say our farewells, we thank them and we promise one day to return their hospitality in Italy. 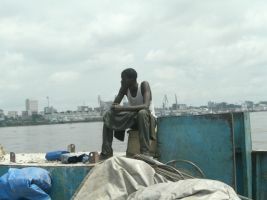 To get to Kinshasa, the capital of Congo DCR from Brazzaville, all we have to do is cross a river - the Congo River. These two capitals are the closet capitals in the world, distanced only by a few kilometres width of a river between them. 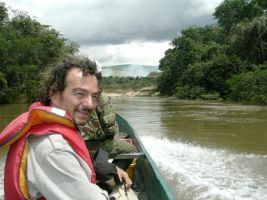 However, the river also separates two very different worlds - Congo (ex French colony) and Congo DCR (ex Belgium colony). To cross the river there is a ferry. What happens daily on that mobile bridge is unbelievable. Hundreds of invalids, the lame and blind spending everyday with their trolleys full of goods. They pay less and this allows them to “do business” and make a living. They also receive privileges at customs. Those without a disability try to earn money the same way attempting to sneak past the customs and police officers. There are nearly a hundred of these so-called smugglers. There are also regular goods that are loaded and unloaded by drudges that carry the unbelievably heavy loads on their heads. Strain and sweat in their eyes seemingly forced and squashed out by the loads they manage to carry. Inside and outside the boat, sacks of flour, cement, clay, wood, round metal beams, plastic chairs, cartons of jam, preserves. As they load and unload, they are pushed, pulled, hit, beaten, and whipped by police officers, customs officers, and gendarmeries and even by the crew of the boat. Finally, a few vehicles may be three or four, they are either luxurious off-roaders or beaten-up old bangers that do not even start. In the middle of all this activity and chaos… is us. For over-landers the entry fee is 10,800francs. The immigration office is in front of the entrance, behind the gate. The customs is in the same building but by the road. The police station is just next to it. They are quick and efficient with us. No money requests. The ticket office is at the end of the road on the right. First, we have to establish the price. 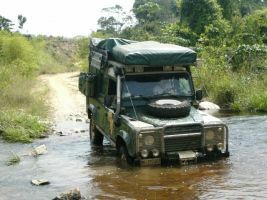 For a Land Rover and its driver 25,000francs, plus 6,500 for the passenger. DO NOT PAY FOR ANYTHING ELSE. There are other payments and dubious taxes that are not for tourists. Many will try to fool you. The ferry that carries cars leaves between 11:00 and 12:30. We wait patiently and keep our wits about us. No one calls when it is time to board an one can risk being left behind in the chaos. After an hour, we approach Kinshasa. We are not allowed to get off and a police officer from the immigration office takes our passports and disappears into the office. Everybody else gets off and the chaotic African system of unloading and loading goods begins. After about 10 minutes, the police officer returns and asks us where we are heading. 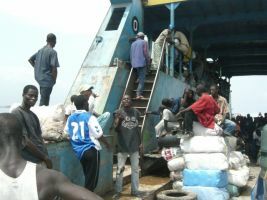 “Matadi, frontier with Angola” we respond, and we start the car ready to get off the boat. In the meantime, outside the drudges reappear filling the ferry with goods for the journey back. We are told to switch off the engine and wait. Shortly after, a crewmember tells us to turn the car around because we have not been accepted. This all stems into a chaotic hour. Negotiations with all kinds of police, useless phone calls to the Italian embassy, calm and not so calm orders. However, in the end all is to no avail. They tell us that the ANGOLA visa is… missing. There is no point in trying to explain that it will be given to us in Congo DCR, in Matadi! The boat leaves. And we are still on it. 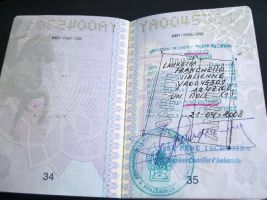 We return to Brazzaville spurned, despite the fact that we had regular visas! 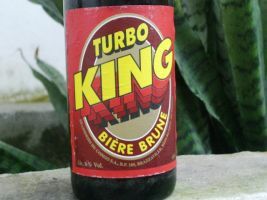 Nobody in the Italian embassy in Brazza and in Kinshasa can believe it. But it is now evening. Tomorrow is the 25th of April and there is a holiday. The day after is the weekend. We will just have to manage ourselves. We are in Congo with our passports valid to leave the country. The visa for Congo DCR is worth nothing. We are franc-less and needless to say, our mood is not very upbeat. We knock at the gate of the Angolan embassy (although it opens at 9 o’clock). We want to explain our situation. They give us a warm welcome and listen to our plight. He then gives us a letter to present at the entrance to DCR. The letter is addressed to the Angolan embassy in Matadi; this should mean that we will get our visa. He tells us, that this is not the first time this has happened. Two photocopies and we are on the road again. We are at the DCR embassy to re-apply for the visas and to ask for an explanation of yesterday’s fiasco. An embassy official welcomes us and begins the proceedings with a suggested 15-euro token of gratitude. Our photocopies and the letter are duly signed, by the afternoon we are ready to try the crossing again. We pay a visit to Franco Villerecci, an Italian who has imported marble sculptures for many years. 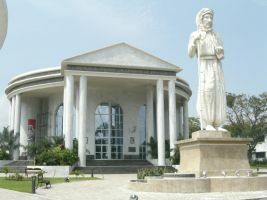 An example is the sculpture at the Brazza mausoleum. After telling him about our mishaps, he kindly invites us to dine with him to lift our spirits. Yet, another lovely evening filled with African stories. Everyone appears to recognize us at the port. We are the “rejected” ones. They point and stare as we pass-by, some beckoning us. Somebody wishes us good luck and with our hard-luck story and some gadgety-things, we avoid repaying the entrance to the port. We use the same strategy on the boat and obtain a big discount. 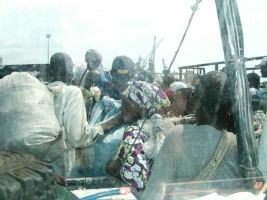 Usual human chaos as we sail forth towards Kinshasa. 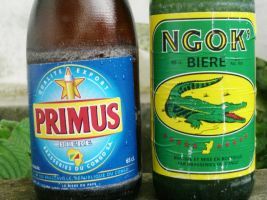 Congo shows good tourist potential, even though it has just recently come out of a civil war. It has many parks and beautiful views. The roads are in good condition towards the north, but quite terrible from the capital towards the sea. This particular area is still under the control of the Ninja “rebels”, the opposition to the current President. Elsewhere only tracks. There is a strong police presence along the roads, but controls are not very frequent. Our experience at the borders (both in and out of the country) was very good. People are polite and helpful. 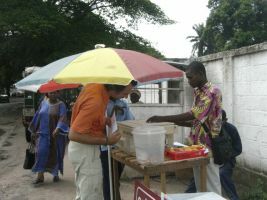 We have not seen street sellers, but outside the capital poverty is strongly felt.